Splish, Splash, Splosh: Our Top Five Water Parks in the World! Beach holidays are fantastic for soaking up the sun and catching the ocean breeze. Most of us have treasured memories of beach towel picnics surrounded by half-built sandcastles. But sometimes, we need a little more excitement. Sometimes, we still want that beach atmosphere—just with more activities! This is when water parks prove to be a fantastic day out for the whole family. Today, we bring you our top five choices for your next active holiday. Read on for more! We begin with World Waterpark in Alberta, Canada, where you never have to worry about the weather because everything is indoors. This huge park is part of the largest shopping mall on the continent, which makes it a great destination for a weekend holiday-within-a-holiday. And the size of its surroundings is reflected by the park itself. It’s the size of four football fields! It houses the largest indoor wave pool in the area, along with a ten-storey bungee jump, nine water slides, and a man-made beach. You can even rent your own private cabanas around the pool! We head next to the east: to Happy Magic Water Cube in Beijing, China. This architecturally impressive complex is the former National Aquatics Centre of the 2008 Summer Olympics. While it may not particularly draw the eye during daylight hours, after nightfall is a truly special sight. Make sure to have your camera at the ready to capture some spectacular photos of the changing colours! Enjoy one of the largest water parks in Asia with its slides, lazy river, spa, and giant wave pool. Many of the world’s water parks have a theme, but none seem quite as creative as Disney World Blizzard Beach in Florida, USA. It is designed as a melted ski resort and features many fun touches such as floating icebergs, Frozen characters, and even a ski lift. If you’re a thrill-seeker, make sure not to miss Mount Gushmore, which is one of the world’s tallest and fastest waterslides. However, there’s a wide range of slides and activities for every level of courage—even a T-Bar to zip children into the water! 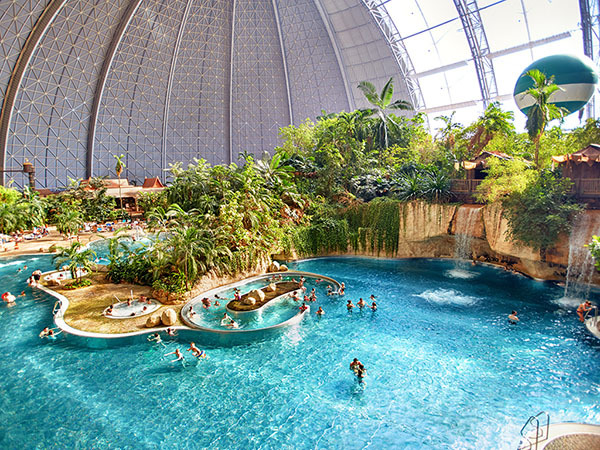 If you’re looking for something different, look no further than Tropical Islands Resort near Berlin, Germany. 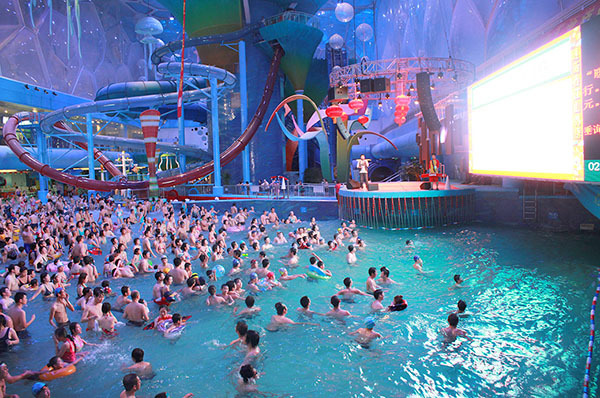 This distinctive water park is housed in a former airship hangar and is the world’s largest indoor water park. Each of its themed areas—inspired by Borneo, Bali, Samoa, and Thailand—offer an impressive experience. Over 50,000 plants and 600 species can be found in its indoor rainforest. And overnight resort guests can use the facilities 24 hours a day, 365 days a year. Don’t forget to try out Germany’s highest water slide tower and island ballooning! Finally, we come to TripAdvisor’s #1 water park in the world: Siam Park in Tenerife, Spain. Merely a hop, skip, and a jump for us Brits, this park really does have something for everyone. The attractions are divided into themes of relaxation, family fun, and adrenaline highs. The phenomenal rides are well organised and maintained, and you can save a little bit of money by taking your own food. Get the most out of the park by spending a little time in each area, and make sure you’re around when the big waves hit the man-made beach! Does your vision of your next holiday involve splashing around? If you’d like to make this an annual event, speak to our friendly Buying Team about what we can offer in these areas and much more! Alternatively, if it’s time for the next generation to discover the fun for themselves, talk to our Selling Team about how we can assist you. Travel and Leisure Group have been assisting people just like you for a quarter of a century, so don’t delay.